UPDATE (Oct. 18, 2018) — Last weekend was big, but this weekend is BIGGER because union members and their families will have ballots! This Saturday, Oct. 20, Labor Neighbor volunteers will conduct neighborhood walks in legislative districts near Everett, Spokane and Vancouver, and have the annual Ballot Drop Walk and BBQ at the UA 32 Hall in Renton. On Sunday, Oct. 21, there will be a second walk in Everett. Check out the schedule for details on all of these events. (Oct. 10, 2018) — This weekend will be the biggest yet for Labor Neighbor as union member volunteers will participate in neighborhood walks in legislative districts near Bremerton, Everett and Ferndale on Saturday, Oct. 13, and in the 8th congressional district near Issaquah on Sunday, Oct. 14. 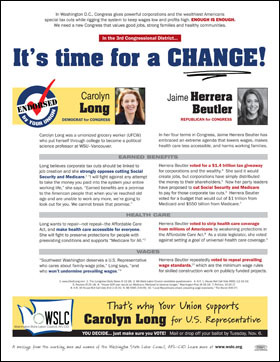 Also, unions affiliated with the Washington State Labor Council, AFL-CIO can order customized candidate-comparison flyers with their organizations’ names and logos so members can see for themselves why candidates have earned their union’s support. Labor Neighbor, the Washington State Labor Council’s grassroots member-to-member political action program, engages union members to inform fellow union members and their families about the candidates and ballot measures that have earned labor’s endorsement, and why. Labor Neighbor volunteers distribute flyers that compare where the candidates’ stand on issues that are important to Washington’s working families. They don’t tell union members how to vote, they just explain who earned their union’s support and why, and then urge fellow members to decide on their own and VOTE! WSLC-affiliated unions can order customized versions of these flyers with their organizations’ names and logos. Check out the flyers and just email WSLC Communications Director David Groves, attaching your logo, to request your custom versions. Bremerton Day of Action from 10 a.m. to 2 p.m. on Saturday, Oct. 13 in the 26th LD. Meet at the SEIU 925 office at 2602 Burwell St. in Bremerton. Everett Day of Action from 10 a.m. to 2 p.m. on Saturday, Oct. 13 in the 39th and 44th LDs. Meet at the Snohomish County LC, 2810 Lombard Ave. #207 in Everett. Northwest Washington CLC Day of Action from 10 a.m. to 2 p.m. on Saturday, Oct. 13 in the 42nd LD. Meet at the Machinists hall, 2064 Vista Dr. in Ferndale. 8th Congressional District Day of Action will be from 1 to 4 p.m. on Sunday, Oct. 14 to explain why labor has endorsed Dr. Kim Schrier over Dino Rossi. Meet at 1320 NW Mall St. Suite E in Issaquah at 1 p.m.
Posted by David Groves on Oct 10 2018. Filed under ELECTION, TAKE A STAND!. You can follow any responses to this entry through the RSS 2.0. Both comments and pings are currently closed.